It’s been exactly 2 weeks since I launched my first ever SaaS project, Cronhub. I wrote a very personal story on how I shipped Cronhub while working full-time. Today, I’m writing another personal story on how I plan to grow my SaaS side-project to acquire more customers in next 100 days. The goal of this article is to share and be transparent about my thinking process. If you’re anyone like me who really wants to build a profitable side-business then I also hope to inspire you with this article to talk and share more about your product. That’s the only way we can help each other to achieve our goals. My name is Tigran and I’m a software engineer at Buffer. Programming is not only what I do for living but also one of my favorite hobbies. I love building side-projects. For the last year or so I’ve started to strongly think about where I want to be in a couple of years. I’ve decided that I want to build a profitable side-business as a source of income. This business will also help me to learn valuable multidisciplinary skills for life which otherwise I’d not have learned. This idea really motivated me and a couple of weeks ago I launched my first SaaS side project. I’ve noticed that there are many articles about the launch of a product and how makers approach the launch day. It’s great. However, there aren’t many stories about what comes after the launch. It’s probably because it’s hard to share with the world the small disappointment that comes after the launch day which is very natural and I don’t blame anyone. To see the sessions or users count drop is not pleasant and hard to share with others. In this article, I want to share how I plan to grow my new SaaS project and acquire more customers after the launch. Mainly, I want to share my strategies and thinking process with you. I thought that sharing first where I am right now will give you a better picture of my starting point. Let’s do a quick rundown. I’ve launched Cronhub on March 20, 2018, and it has been two weeks now. Cronhub became the #2 product of the day with more than 800 upvotes. Seeing people upvote or comment is a great feeling. Feedback from people was mostly encouraging. On the next day of the launch, I’ve got my first and only paid user. To see the email from Stripe notifying that I have a new paid customer was the best feeling. I’d not change that feeling with anything. 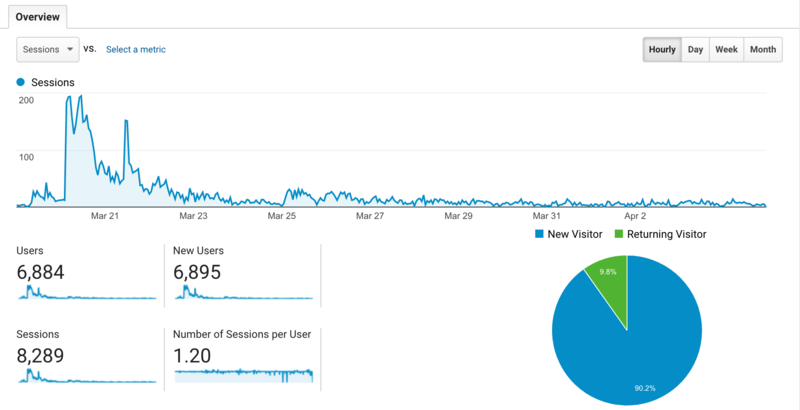 For the last 2 weeks, I saw the number of sessions drop significantly after the launch day. To be honest, it wasn’t a big surprise to me since I knew exactly what to expect from the previous side-project launches. Here is the screenshot of the Cronhub sessions for the last 2 weeks. The distribution below is by the hour. I’ve had 8289 sessions in total so far. Cronhub GA numbers for the past 2 weeks. Two weeks after the launch I have 1 paid user, about 450 sign-ups and 125 active cronjob monitors on Cronhub. I consider the monitor active if it has at least one ping. My MRR is $7 and I currently spend around $40 per month to cover all Cronhub expenses. I expect the expense number to grow a little bit in the future. Now, that we know where I stand I’ll go ahead and share what comes next for Cronhub and how I plan to acquire more paid users in the next 100 days. My goal is to find a product market fit. What does it mean to me? It means to acquire at least 10 paid customers on “Developer” plan and one customer on the “Team” plan (I’ll be launching the team plan next month). These numbers are random but also important. The reason I’m so focused on these numbers is that I believe nothing endorses the value of the product more than paid users. If I have 10-15 paid customers I can tell myself that I’ve found or I’m very close to product-market fit. With my goal and these numbers, I want to measure the success of the decisions I make around Cronhub. My product decision domain is very broad and it’s not tied only to what features I should build next. I also ask myself how I should market Cronhub or who my ideal customer is. If you ask me now I won’t know the exact answer. Individual engineers and the engineering teams? Probably, but I have to be certain. I want to eventually find the niche market that Cronhub belongs to. If you’re an engineer like me you know that building is most likely the easiest part and what comes next is the hardest. I’m so pumped to challenge myself, though. Now that I have set my goal I want to talk about the steps I’ll take to achieve it. Of course, as any other goal, it’s possible that I won’t achieve it. However, what drives me is really the process of getting there. During the next 100 days, I’ll learn important lessons from all of the good and bad decisions I make and I promised myself I’d write them down in my decision journal. Decision journal helps me to reflect on my decisions so I can become a better decision maker in the future. I’m a product engineer and this step is probably the one I’m most qualified for. Spending time to build new features or even fixing bugs is the most fun activity compared to other things I have to do. However, I know it’s a myth that if you build it people will come. I don’t believe in that. Most engineers tend to measure their productivity based on how much they ship. I’m afraid I’m not an exception here, however, I try to change the way how I think about my productivity. It doesn’t always have to be materialistic. Sometimes the time you spend to think about a particular product feature is the most well-spent time. Before jumping to the code to build a new feature I try to spend enough time to answer the following questions. Is this feature really needed? If the answer is yes then I ask another question. Is this the most important thing I should be working/building right now? Usually, these two questions are enough to decide whether this feature will make it or not. Prioritizing and time management are likely the most important skills for solo-developers. As a single founder or maker, we don’t have too many resources to rely on so we do everything by ourselves. That’s where the time and prioritizing come to play. 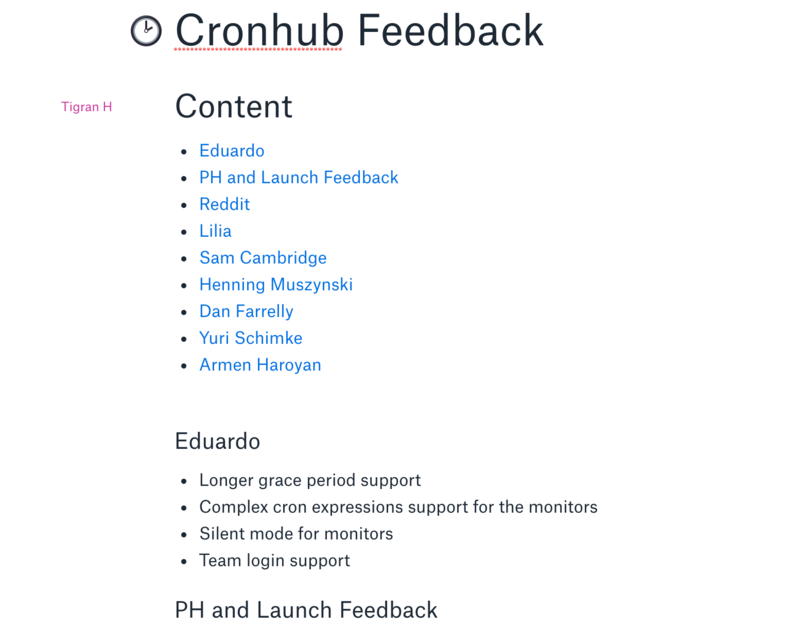 Most of the Cronhub product ideas come from the user feedback as well as my own intuition. It’s a mix of these two. For user feedback, I have a dedicated Dropbox Paperwhere I collect all the Cronhub feedback I’ve received from different people and users. This is how I’ve organized it so far. I keep most of my ideas in the Trello Backlog column and then prioritize them into product cycles. 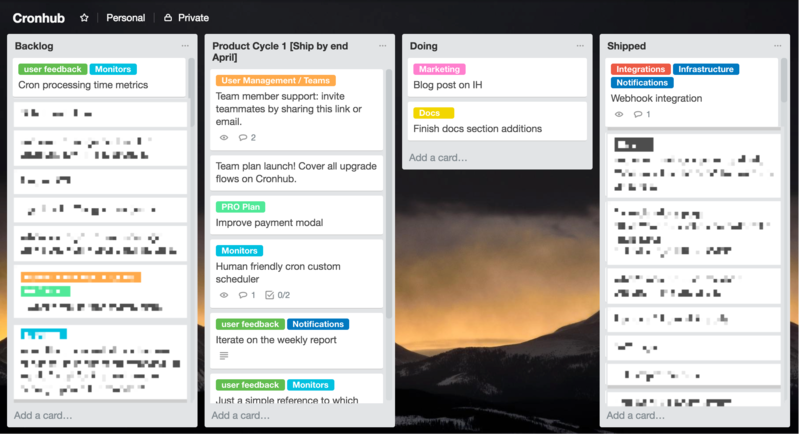 At Buffer, we use 6-week product cycles and I find them very valuable. As a team, we get a lot of things done within 6 weeks. I’ve decided to do something very similar with Cronhub as well. The difference is that my cycles are a month long and I have one week in between cycles to prioritize the most important tasks for the next cycle. If a single feature request comes up many times it gets higher attention from me. For instance, “Webhook Integration” was one of them and I shipped it yesterday. Every feature is broken down into very small tasks. If I need to spend more than a day on a single task then this task is not small enough. Keeping my tasks smaller has been key to see a continuous progress. For the next 100 days, I plan to finish 3 product cycles. I hope after 3 months the improvements on Cronhub will be very visible. What features do I have in mind for the next 3 cycles? I want to launch the new “Team” plan. It will be $49 per month and it will include unlimited team members with up to 100 monitors. I can start targeting teams too when I have this plan available. This plan will most likely have a “Free Trial”. I know my ideal customers are teams and not individual developers. Also, I think selling a product to businesses is a lot easier than to individual consumers. I want to improve the weekly report I send to all Cronhub users. Weekly reports are super important and I want to make it more valuable to my users. Product improvements and better documentation. As a developer, I really appreciate the importance of a well-documented product. I envision Cronhub docs to also include educational materials. I think all these will keep me busy for the next couple months considering that I also have a full-time job that I love! I know I have to market Cronhub no questions asked. However, I’m not sure how I should market it and what the best marketing strategy is for Cronhub. I’ve read Gabriel Weinberg’s “The 19 Channels You Can Use to Get Traction” article (which is great btw) and it helped me to find a temporary answer. I want to focus on the marketing channel I personally enjoy and my working competitors dismiss. I think that would be content marketing. None of my competitors are focused on content marketing and I personally enjoy writing articles and educational materials. After all, I come from a family of teachers. But first, I have to define what content marketing means for Cronhub. Most of my users are developers so I roughly know that my target audiences are developers and developer teams. I should write content that acquires more developer visitors. I’ve created the following flow to better visualize my marketing strategy. How I visualized the customer acquisition flow. According to my Google Analytics numbers, the 15% of my visitors sign up for Cronhub. I don’t know what the industry average is but I feel 15% is not bad. Cronhub is a very niche product so I don’t ever expect a very high number of signups anyway. If my visitor/sign up rate is not low then my main challenge is to convert already signed up users to paid customers, right? For that, I have to work on the product side. I know that awareness and acquisition are all marketing efforts but activation is all about the product. My marketing goal is to bring visitors that are more likely to convert to paid customers. Since I don’t know who exactly those potential customers are I want to bring more visitors so I can put the conversions into buckets by visitor types. This way I can differentiate the type of visitors that convert and that will probably be my niche target audience. When I have a better idea of my target audience I can research to find out what really interests them. I’ll write blogs posts and educational articles on the topics that interest them. But for now, I’m going to focus on the broad developer market and write content for that audience. This article is part of that strategy. Since I’m a developer it’s not hard for me to guess what type of content will attract other developers. Building a product for the market that you’re part of is really invaluable. I built Cronhub to scratch my own itch and because I believed that there have to be other developers facing the same problem. I hope I’m right. Another reason why I think content marketing is a better fit for Cronhub is that I strongly believe that investing in a quality content now will pay off in the long run especially for SEO. I’ll probably write a different article just about SEO but in a nutshell, I’m planning to get better at the SEO game by hosting my own blog on Cronhub and constantly producing quality content for developers. Apart from content marketing I also want to touch a quick hack I’ve done on Twitter to bring more visitors to Cronhub. Most of my Twitter followers are tech people so it fits well to use my existing audience as well. I love Twitter and I use it to occasionally tweet updates on Cronhub. Some of my past tweets got high attention very recently. Those tweets most often earn profile clicks. Knowing that I’ve intentionally added a direct cronhub.io link to my Twitter profile so people checking out my profile are more likely to click on that link. Believe it or not, it really worked. The days when I have high tweet engagement I have relatively more visitors to Cronhub. It has become an essential part of my social media marketing plus I really enjoy connecting with my followers. One example is my most recent tweet that earned high impressions thus many profile clicks and checking GA I saw I had more visitors for that day. To sum up, marketing is hard for me and it’s okay. I know it’s hard because It’s new to me and I don’t have the necessary skillset just yet. However, I’m really interested in learning about different marketing strategies and understand what other marketing channels may work for Cronhub. Content marketing is very time consuming especially for a single person so I have to consider different channels as well at some point. However, as I said content marketing is very natural to me because I really enjoy writing! Now that I’ve shared my goal and strategies with you the next step for me is to accomplish them. And this has to be without burning myself out or exhaustion. Since I have a full-time job I plan to work 1-2 hours every day on Cronhub. Rest is very important to me so spending long nights or working long hours on the weekends is not an option. I’ll be dividing my time between product and content marketing. I’m so excited for my journey and can’t wait to share more in the future. Expect more articles like this from me. Thank you very much for reading. I hope you enjoyed reading my story and learned at least one thing from it. Even if you didn’t maybe this inspired you. If you’re building a product and this story resonates with you I’d love to hear from you. What have you done for the first 100 days after the launch of your product? Please feel free to comment with your questions. You can reach out to me on Twitter or email me. If you’re a developer or part of a developer team that uses cronjobs you can try Cronhub for free. Use coupon “indiehackers” to get 20% discount if you upgrade to “Developer” plan.